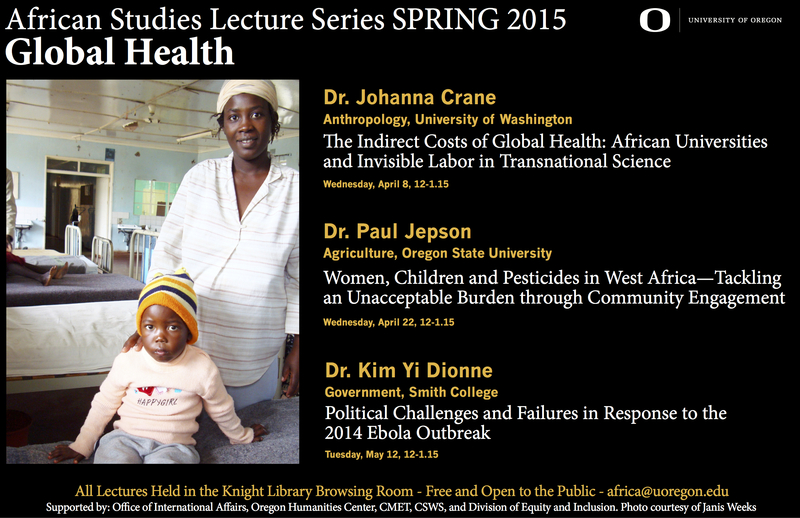 All Lectures Held in the Knight Library Browsing Room, unless otherwise noted, and are free and open to the public. Lectures will be followed by a Q and A session. Appointments are available for both faculty and students to meet with the speakers. 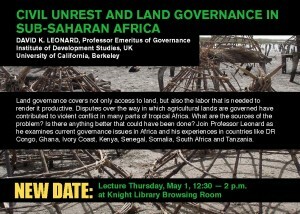 To make an appointment, please contact africa@uoregon.edu. Dr. Emory is Assistant Professor of Art History at Emory University. She has worked in West Africa, in Senofu-Mande regions. Patience is a Zimbabwean woman who grew up playing mbira in traditional ceremonies. She is university-educated and fluent in Shona and English. Dr. Iddrissu is Assistant Professor of Ethnomusicology and Dance at University of Oregon. He is a traditionally trained dancer, musician, and historian from Northern Ghana. He has toured the world with traditional singing and dance groups. Dr. Crane is assistant Professor of Anthropology at the University of Washington-Bothell. She received her Ph.D. in Medical Anthropology from the University of California, Berkley. Her research brings together history, science, technological studies, medical humanities, bioethics, and global health. Her book Scrambling for Africa: AIDS, Expertise, and the Rise of American Global Health Science examines the changing U.S. response to the AIDS epidemic in Africa. With a focus on Uganda, Crane’s research shows how, in less than a decade, Africa went from being a continent largely excluded from American advancements in HIV/AIDS medicine to an area of central concern in the transnational production of medical knowledge, research money, and pharmaceutical profiteering. In the future, she plans to continue to study the politics of global health science, as well as return to questions of medicine and power in the U.S. through researching the field of prison medicine. Dr. Jepson is a Professor in the College of Agricultural Science and the Director of the Integrated Plant Protection Center at Oregon State University. He received a Ph.D. in Applied Insect Ecology at Cambridge University. His research interests include the study of pest and natural enemy population dynamics in agricultural systems with a particular focus on pesticide management and side effects. Dr. Kim Yi Dionne is Five College Assistant Professor of Government at Smith College. She studies and teaches African politics, with a focus on the politics of interventions aimed at improving the human condition and recounting the opinions of ordinary Africans toward such interventions. Much of her published research examined HIV/AIDS. Her current book project is on the global response to HIV/AIDS in Africa, with a focus on Malawi, where she was a Fulbright Scholar in 2008-2009. She is a regular contributor to The Washington Post’s Monkey Cage blog on politics and political science. 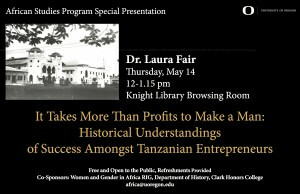 SPECIAL EVENT: Thursday, May 14, 2015 12-1.15pm – Laura Fair. History. Michigan State University. Dr. Fair is an Associate Professor of History at Michigan State University. She received her Ph.D. in History from the University of Minnesota with a minor in African Studies. Her current project is a wide-ranging study of commercial cinema in colonial and postcolonial Tanzania. Dr. Fair’s first book was Pastimes and Politics: Culture, Community and Identity in Post-Abolition Urban Zanzibar, 1890–1945 (Ohio University Press, 2001), which was nominated for the Herskovits Prize from the African Studies Association. In 2013, Fair published Historia ya Jamii ya Zanzibar na Nyimbo za Siti binti Saad (A Social History of Zanzibar and the Songs of Siti binti Saad) in Kiswahili, and the book has been warmly received in East Africa. Dr. Fair has published in a wide range of journals, including a recent piece in the American Historical Review. 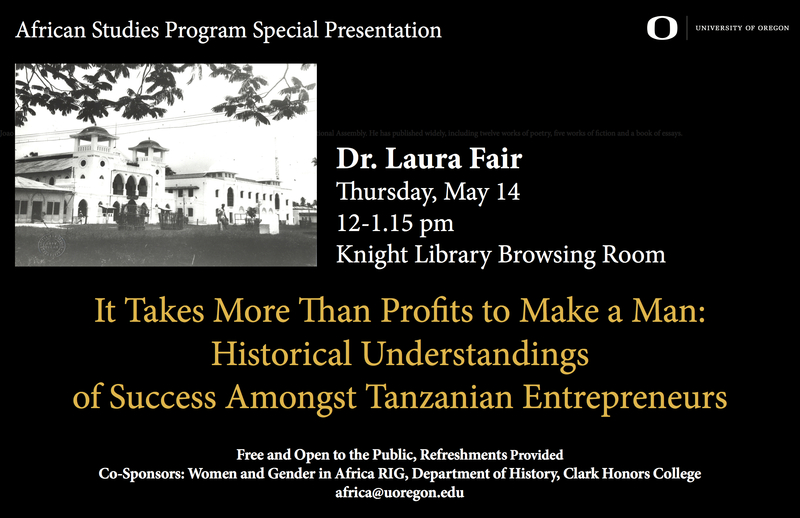 Laura was a member of the History Department at the University of Oregon from 1994 to 2007, and was a founding member of the Women and Gender in Africa and the African Diaspora RIG. Dr. Pugatch is an Assistant Professor of Economics in the School of Public Policy at Oregon State University. He is also a research fellow at the Institution for the Study of Labor, and received his Ph.D. in Economics from the University of Michigan. His research interests include development, labor, and economics of education. In 2012-2013 he completed an evaluation project in the Gambia on the Teachers Hardship Allowance Program. This consulting work was completed for the World Bank and the Gambian Ministry of Basic and Secondary Education. His recent publications include “Prospective Analysis of a Wage Subsidy for Cape Town Youth” (with James Levinsohn) in the Journal of Development Economics. His current work focuses on youth unemployment in South Africa, the effect of Mexican immigration on labor markets in the U.S, and education reform in the Gambia. Dr. Balogun is Assistant Professor in the Departments of Women’s and Gender Studies & Sociology. She received her Ph.D. in Sociology from the University of Berkley. Her research focuses on gender, globalization, nationalism, race/ethnicity, and migration. She has published articles in outlets such as Ethnicities and Gender & Society. She is currently working on a book examining the Nigerian beauty pageant industry in light of the country’s political transitions. Dr. Hardin is Associate Professor in the School of Natural Resource and Environment, and the Department Anthropology at the University of Michigan. She received her Ph.D. in Anthropology from Yale University and her areas of study include human/wildlife interactions, and social and environmental change related to wildlife management, tourism, logging, and mining in Central African Republic, Cameroon, and Congo Brazzaville. Recent projects focus on the intertwined practices of health, environmental management, and corporate governance in southern and eastern Africa. Dr. Hardin has served as a visiting professor at Universite of Paris I (Sorbonne) and the National Museum of Natural History in Paris. Her recent book, Transforming Ethnographic Knowledge, explores the discipline of anthropology as a set of skills and tools for social change in sectors as different as business, biological conservation, conflict resolution, and biomedical care. Dr. Stoeltje is Emerita Professor in the Departments of Anthropology and Folklore and Ethnomusicology at Indiana University. Over her long career, she has researched and published on topics such as performance, ritual, nationalism, gender, and anthropology of law. 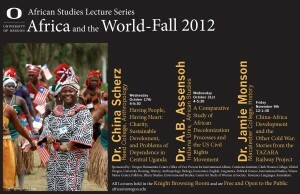 Geographically her research focuses on Ghana, West Africa and American West. She has received funding from Fulbright-Hays Research Scholar Grant, Weatherhead Resident Scholar, and USIA Linkage Grant on Performance. 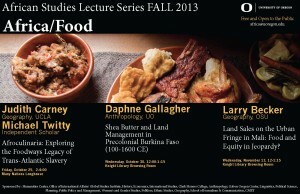 Dr. Prais is the Assistant Director of the Institute of African Studies at Columbia University. She received her Ph.D. in History and Women’s Studies from the University of Michigan. Her research interests include citizenship and social movements and colonial and gender identity formation in twentieth-century West Africa. She has received research funding from Columbia’s Committee on Global Thought, the American Council of Learned Societies, and the University of Michigan. Recent publications include “‘Casting the Badge of Inferiority Beneath Black Peoples’ Feet’: Archiving and Reading the African Past, Present and Future in World History” with M. Diouf, Global Intellectual History, eds. Samuel Moyn and Andrew Sartori (Columbia University Press, 2013). She is currently working on a book manuscript, entitled, Between Empire and the World: West Africans and the Politics of Race and Culture in Interwar London and Accra. 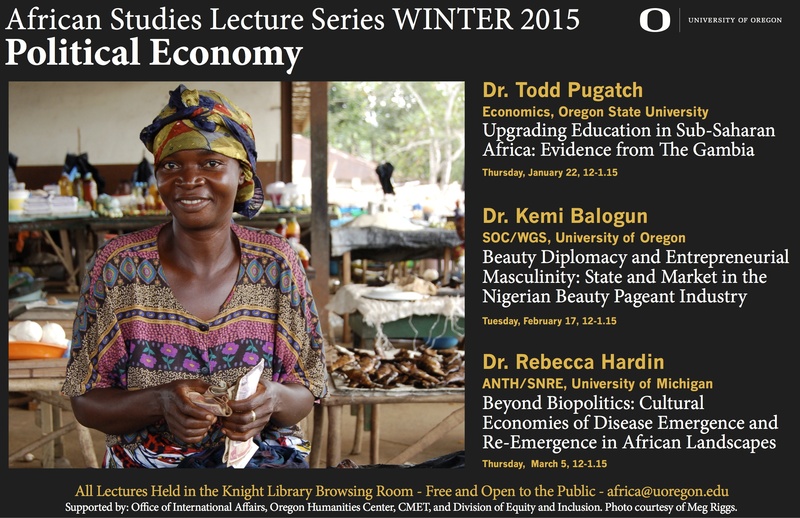 Melissa Graboyes is the Assistant Director of the African Studies Program at the University of Oregon. She received her Ph.D. in History from Boston University specializing in modern East Africa and medical history. She also received her Masters in Public Health with an emphasis on medical ethics. Her research interests are broadly focused on the intersections of history, ethics and medicine. She has conducted archival and ethnographic research in Tanzania, Kenya, Zanzibar, and Great Britain, and was funded by the US National Science Foundation. She is completing a book manuscript, “The Experiment Must Continue: Medical Research and Ethics in East Africa, 1940-2014.” Graboyes has also worked as a public health practitioner in Tanzania for Population Services International and within the United States for Planned Parenthood. Land governance covers not only access to land, but also the labor that is needed to render it productive. Disputes over the way in which agricultural lands are governed have contributed to violent conflict in many parts of tropical Africa. What are the sources of the problem? Is there anything better that could have been done? Join Professor Leonard as he examines current governance issues in Africa and his experiences in countries like DR Congo, Ghana, Ivory Coast, Kenya, Senegal, Somalia, South Africa and Tanzania. Dr. Gilman is an Associate Professor in the Department of English and Director of the Folklore Program at the University of Oregon. She received her Ph.D. and M.A. in Folklore with an African Studies Minor from Indiana University, Bloomington. Her most recent work includes a book titled The Dance of Politics: Performance, Gender, and Democratization in Malawi, and a documentary film about G.I. resistance called Grounds for Resistance. She has received funding from Fulbright, and Fulbright-Hays. Dr. Gilman is interested in relationships between performance genres, usually dance and music, and issues of power related to gender, class, cultural identity, and politics. Dr. Gallagher joined the UO Department of Anthropology in 2010 as a lecturer, courtesy research associate and undergraduate adviser. 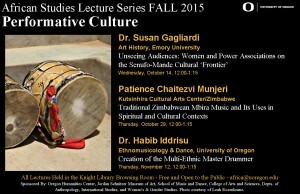 During this time she initiated the African Studies Lecture Series as co- organizer. Dr. Gallagher received her MA and Ph.D. in Anthropology from University of Michigan, Ann Arbor and has conducted research in Burkina Faso, Mali, Kenya and Tunisia. Her research interests include cultural context of agricultural practice, human ecology of savanna environments, and vegetal salt industries of West Africa. Dr. Becker is a professor of Geography and the Director of Environmental Sciences Undergraduate Program at Oregon State University. His specialties are agricultural, food systems, and development in Mali and Côte d’Ivoire. He gained extensive experience while completing his post-doc work with West African Rice Development Association (WARDA) in Cote d’Ivoire (now called the Africa Rice Center). He received his M.A. in education from Stanford University and his Ph.D. in Geography from School of Oriental and African Studies (SOAS), University of London. His current research interests include agrarian change and natural resource management. Dr. Scherz is a medical anthropologist interested in development, ethics/morality and humanitarianism. Dr. Scherz received her PhD from UC-Berkeley in 2010, and has carried out research in both Uganda and Ireland. “A Comparative Study of African Decolonization Processes and the US Civil Rights Movement”. Dr. Assensoh’s talk provides a comparison of the leadership of the two movements and processes, bringing African American and African political and social histories in contact. As a historian and Professor Emeritus at Indiana University, he has been affiliated with IU’s African American and African Diaspora Department for many years, and has published books across African and Africa-American Studies (Rev. Dr. Martin Luther King, Jr., and America’s Quest for Racial Integration, African Military History and Politics, 1900-Present, and African Political Leadership). He is currently working on a new manuscript about Malcolm X, which will be co-authored with his wife, Dr. Yvette Alex-Assensoh. Dr. Monson is currently conducting research on China-East Africa relations during the Cold War years. She is Professor of History at Macalester College. Past books have included Africa’s Freedom Railway: How a Chinese Development Project Changed Lives and Livelihoods in Tanzania (Indian University Press) and Women as Food Producers in Developing Countries (Crossroads). She has received funding from the NEH, ACLS, the Carnegie Foundation, Social Science Research Council, the Wissenschaftskolleg zu Berlin (Institute for Advanced Study), and the Fulbright-Hays program. She conducts research in Swahili, German, Spanish, French and Chinese. Dr. Bosire is newly arrived at the UO, has his home in the Department of Linguistics and is responsible for all three years of Swahili instruction on campus. He received his Ph.D. in Anthropology and Linguistics from State University of New York, Albany and has conducted research in Kenya and the United States. His talk addresses what role Swahili plays in the holistic development of East Africa, focusing on the significance of the language for those from the Swahili Nation. Dr. Candice Goucher is Professor of History at Washington State University and has conducted research in West Africa, the Caribbean, Mauritius, and the Northwest. She was trained as a historian and archaeologist, receiving a masters degree in art history & archaeology from Columbia University and a PhD in African History from UCLA. She has been active in writing texts on world history and in the production of films such as “The Blooms of Banjeli: Technology and Gender in West-African Iron-Making,” which won the Society for Visual Anthropology Award of Excellence. She is currently on the Board of Editors for the 9-volume Cambridge History of the World and she is writing a history of Caribbean food. 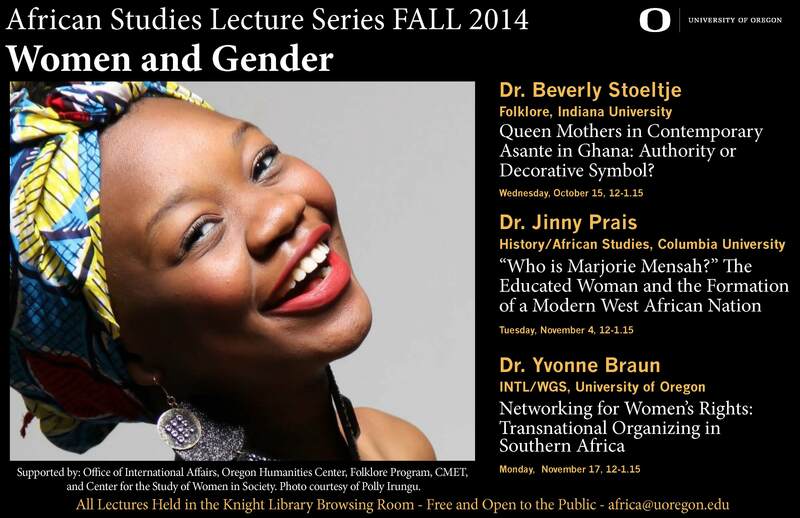 Dr. Fofana is Associate Professor of French at Willamette University. He received a Licence es Lettres and a Maîtrise in English from Cheikh Anta Diop University, Dakar, Senegal. He also received an MA in French Literature and Civilization from Michigan State University, and completed his Ph.D. in African Languages and Literature from University of Wisconsin, Madison. His research and teaching interests include French language and literature, Francophone literature and cultures, African languages, literature and films. He is the author of The Films of Ousmane Sembène: Discourse, Politics and Culture. 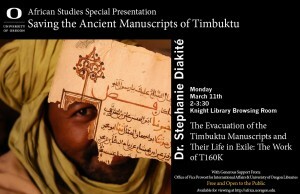 Dr. Diakité will tell the moving story of the evacuation of the private libraries and the national collection in Mali. She will also share the work she and Abdel Kader Haidara, co-implementor of the evacuation and curator of one of the largest private libraries in Timbuktu, have initiated to safeguard the patrimony in exile and to share its significant governance and conflict resolution content for the purpose of enduring peace in Mali. Dr. Diakité and Abdel Kader Haidara hope to work with people worldwide in research, conservation and governance fields to integrate the significant governance and conflict resolution knowledge in the manuscripts into the peace process in Mali in truly participative ways. They believe that given the opportunity, the manuscripts and the indigenous peace building knowledge they contain can enable Malians to find enduring solutions to the crises they are experiencing both in the north and in the south. Further, they believe that lessons learned from this process can be extended to other areas of persistent conflict in Africa for the purpose of enduring peace. Dr. Joshua Linder is a primatologist in the Department of Sociology and Anthropology at James Madison University. His research examines the consequences of defaunation for plant and animal communities and explores how humans perceive and become motivated to protect their natural environment. His broad research interests include primate ecology and conservation, hunting in the tropics and the bushmeat trade, protected area management, and oil palm and land grabbing. 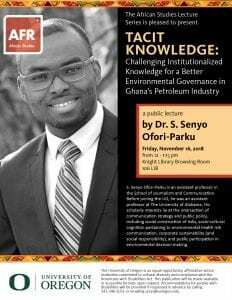 He serves as a Board Member of, and scientific advisor to SAVE Wildlife Conservation Fund on their campaign against the development of an oil palm plantation in Cameroon by an American agribusiness company. Linder earned his Ph.D. from the Graduate Center of the City University of New York, and has published in journals such as the American Journal of Physical Anthropology and Biological Conservation. His research takes place in Korup National Park in Cameroon, where he has been studying primate ecology and conservation for the past decade. Much of his research has focused on bushmeat hunting (hunting for wild meat) and its effects on animal populations and forest regeneration. Dr. Bishaw is a part of the Department of Forest Ecosystems & Society at Oregon State University and conducts research related to agroforestry and social forestry, riparian management of agricultural lands, and international forestry. He has participated in research and program development in South Africa, Ethiopia and southern Africa (Malawi, Mozambique and Zambia). These projects have variously addressed food security, watershed management, poverty alleviation and land degradation across the African continent. Dr. Bishaw was educated in Africa, Europe and the United States, and has over 25 years of experience in forestry, natural resources and agriculture education, research, outreach and administration. He received his Ph.D. from Oregon State University in Forest Resources in 1993, and an MS in Tropical Forestry from the University of Dresden, Germany in 1985, and a B.Sc. in Plant Sciences from Addis Ababa University, Ethiopia in 1979. The talk will focus on the unusual system of land titling for Africans in the British Colony of the Cape of Good Hope in the late 19th and early 20th centuries. The classic view of the system is that surveyed titles to family plots were a simple colonial imposition intended to dispossess people and uproot labor. But an investigation of the development of these schemes in the lands of Xhosa-speaking people just northeast of the Kei River between the 1870s and 1920s exposes more complicated threads of advocacy, negotiation, resistance, and simple circumvention on a changing ecological and demographic landscape that led colonial technicians to change their practices in response. 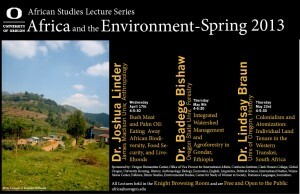 Dr. Braun is Assistant Professor of African History at the University of Oregon, and primarily researches questions of land division and landscape transformation in southern Africa during the 19th and early 20th centuries. He received his MA from Michigan State University in 1997 and his PhD in history at Rutgers University in 2008. Dr. McGruder is an occupational therapist and medical anthropologist who has worked on the island of Zanzibar for over 20 years. Her work combines practical experience in mental health therapeutic programs with an academic interest in cross-cultural concepts of health and disease. In this talk, she will contextualize the WHO’s finding that individuals diagnosed with schizophrenia have a better chance of recovery in poor countries than rich ones through a discussion of her ethnographic work in Zanzibar. Dr. Moshi is a leading scholar in the pedagogy of African languages and Director of the African Studies Institute at the University of Georgia. Educated in Tanzania, England, and the United States, she has worked extensively on the importance of cultural contexts in Kiswahili language instruction and has run numerous study abroad programs for undergraduates interested in learning Kiswahili. 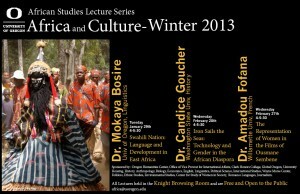 In this talk, she will examine how cultural concepts of social and gender roles are embedded in African languages. Dr. Millen holds graduate degrees in public health and anthropology and was the Director of the Institute for Health and Social Justice in Boston prior to joining Willamette. She has conducted ethnomedical and epidemiological research in West Africa, particularly in Senegal where she was a Peace Corps volunteer and lived for over eight years. She is also an editor of Dying for Growth: Global Inequity and the Health of the Poor, and Global AIDS. In this talk, she will discuss her current ethnographic work with skilled Africans living abroad who are bringing health resources to their home countries. Dr. Rubert is an economic historian with a long-standing interest in colonial era Zimbabwe and is the author of The Historical Dictionary of Zimbabwe. He has studied such topics as tobacco farming and wage labor, and, more recently, a comparison of the cultural, socio-political, and economic contexts of health care for indigenous Africans and white settlers. In this talk he will explore how colonial policies impacted the environment of the central region of Zimbabwe, as well as events since the late 1990s. Dr. Mueller is an ecologist with an interest in the potential contributions of local knowledge to formulating better models of ecological process. Working in the W Transborder Park in southwestern Niger, where she was a Peace Corps volunteer, her fieldwork combines ecological surveys with interviews and participatory research in collaboration with local communities. In this talk, she will explore the advantages and difficulties of incorporating local ecological knowledge into conservation policy. Dr. Dueppen is an archaeologist who is spending two years at the University of Oregon as an ACLS New Faculty Fellow. He has conducted fieldwork in Senegal, Kenya, and Burkina Faso, where he currently directs the Kirikongo Archaeological Project. His research at Kirikongo focuses on the development of institutionalized inequalities and their rejection and replacement by an egalitarian political system in the 12th century CE. In this talk, he will discuss sources of spiritual authority and power in Voltaic societies and their diverse local manifestations. Dr. Tappan is a medical historian who has conducted extensive archival work in Uganda and Great Britain with an emphasis on the local reactions to policy changes and public health campaigns. In this talk, she will examine popular conceptions and policy regarding nutrition for expecting and new mothers in pre- and post independence Buganda. Dr. Lobnibe is a socio-cultural anthropologist working in Ghana with interests in peasant economy, political economy, agrarian and environmental systems, labor migration, social organization, popular culture, historiography, and the Black Diaspora. Educated in Ghana and the United States, his current research focuses on the impact of migration from rural villages to plantations on both home communities and the migrants themselves. In this paper, he will explore how these migrants are incorporated into the modern state political system.